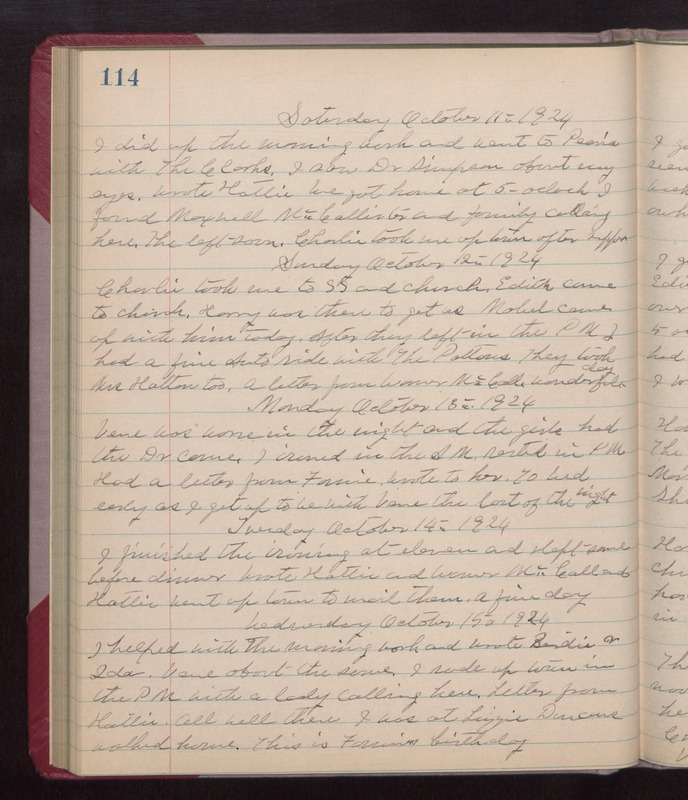 Saturday October 11th 1924 I did up the morning work and went to Peoria with The Clarks. I saw Dr Simpson about my eyes. Wrote Hattie. We got home at 5 oclock. I found Maxwell McCallister and family calling here. They left soon. Charlie took me up town after supper. Sunday October 12th 1924 Charlie took me to S S and church. Edith came to church. Harry was there to get us. Mabel came up with him today. After they left in the PM I had a fine Auto ride with The Pattons. They took Mrs Hatton too. A letter from Warner McCall. wonderful day. Monday October 13th 1924 Vene was worse in the night and the girls had the Dr come. I ironed in the AM. Rested in PM. Had a letter from Fannie. Wrote to her. To bed early as I get up to be with Vene the last of the night. Tuesday October 14th 1924 I finished the ironing at eleven and slept some before dinner. Wrote Hattie and Warner McCall and Hattie. Went up town to mail them. a fine day. Wednesday October 15th 1924 I helped with the morning work and wrote Birdie & Ida. Vene about the same. I rode up town in the PM with a lady calling there. Letter from Hattie. All well there. I was at Lizzie Duncans. Walked home. This is Fannies birthday.